On November 26, 2018, Wilma was a panelist on The Many Roads to Sponsorship Success across Canada workshop at the Canadian Council for Refugees fall consultation in Montreal. Together with representatives of sponsoring groups in Winnipeg and Quebec City, she described the successes and challenges of refugee sponsorship in a smaller community, explaining how LAERC has been able to sustain interest and momentum over many years. 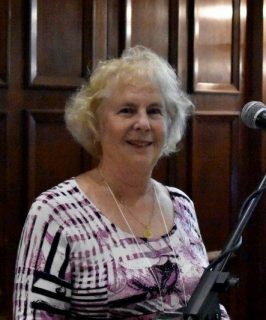 An abridged version of her address appears in the Spring 2019 issue of the Presbyterian Connection newspaper. It is an honour and a privilege to be here with you this afternoon. I am the Chair of the Leamington Area Ecumenical Refugee Committee, LAERC for short. This sponsoring group was formed in 2005. An Anglican minister and a Mennonite medical doctor, while out golfing at a course along the north shore of Lake Erie, decided that instead of just talking about the terrible plight of refugees around the world, they would do something. 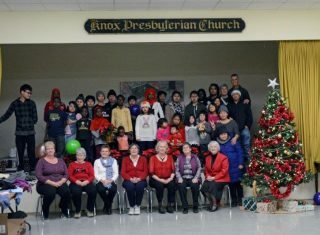 They spoke to a group of local ministers and subsequently, seven churches, in one of the most southern towns in Canada, each pledged a donation of $5000, chose a representative to serve on a committee and agreed to work together to sponsor one refugee family a year. The two original founders later moved away but the committee carried on and the LAERC community keeps growing. So far, we have sponsored 19 family groups – that’s 84 people, babies to grandparents, plus 14 Canadian babies born here. For fourteen years, the LAERC committee has had a core group of ten very involved, dedicated members who are always seeking ways to make life better for our newcomers. Over time, some members have died, some moved away and some retired due to poor health, but we have never had any difficulty recruiting new members. Somebody always steps up. The churches have stayed very supportive but members also come from the community. This is the advantage of a small town. Everyone knows about the LAERC group and that we help refugees and they want to be a part of it. The committee members come from various backgrounds, of accounting, nursing, teaching, fund raising, a local candidate for an MP position, home repair, etc. One person takes on the responsibilities of being Chair, one is our Treasurer, one is Secretary, one looks after all the government paperwork, another keeps track of all the medical stuff, one is the liaison with the schools, one gets articles and photos of LAERC’s activities published in the local paper on a regular basis, another fixes the toilet, repairs a hinge, etc. as needed, another helps with moving, and so on. We each use our skills to help the newcomers as if they are extended family. We always know who to call to get something done. Having lived in a city and being involved with refugees there, I know being in a small town is a big advantage. Word gets out. Being in a small town is a tremendous positive for the newcomers and LAERC’s work. It is not unusual for me to get a phone call, from someone I don’t know, offering to help a newcomer family in some way. And I regularly get invitations to speak to churches and community groups about our experiences in sponsoring refugees. It seems that people have a higher level of trust and are more willing to reach out on a personal level. It has turned out, that this small Ontario town, with a population of 33,000 coming from 42 countries and speaking over 70 languages, is a perfect place for newcomers to fit in, to have the support of others who have experienced being uprooted and to feel a part of the this multi-cultural Canadian community, very soon after arrival. Another huge benefit is the town being situated within a thriving agricultural area. Leamington is known as the Tomato Capital of Canada, and in the middle of town it has a 2 million square foot up-dated facility where over 50,000 tons of tomatoes are processed each year on 24 production lines. Also, with over 3,000 acres of greenhouses growing cucumbers, tomatoes and peppers, the largest concentration of greenhouses in North America, there are many, many jobs for which little or no English is needed. This means that by the time the newcomers have finished their year of sponsorship and they have learned basic English they can get a job. Dads work. Sometimes Moms work. And older ‘children’ work. These jobs are usually started by a friend saying, “We need help packing on Saturday. Can you come?” The first few times they get paid ‘cash’. The newcomers realize that this is work they can do this. They demonstrate they are good workers. They get hired! These jobs pay minimum wage with a six day work week and lots of overtime in the busy season. After three months, they get benefits. This area is flat farmland so workers can ride a bike to work, get a ride with a friend or there is a flat fee taxi service. The job market has proven to be so positive for our Karen newcomers, that almost forty families that were sponsored to other communities in Canada, have now chosen to move to Leamington. They get jobs, buy homes and are expanding the community. Having a job and an income means independence and being able to improve life for their family. They feel pride in having a job in Canada. They can save and buy a home, get their driver’s license, purchase a vehicle, send a little more money back to their family members, and so on. The stress and worry and fear and desperation of the refugee years gradually drains from their bodies and minds. The successes of these newcomers are very rewarding for our LAERC members who know they had a small role in making it possible. It energizes us and makes us carry on and apply to sponsor another family. I am sure if our families were sad and struggling to find work or depressed and disappointed in their efforts to become independent, our Committee would not be keen to bring another family to Canada and members would probably leave our group for more uplifting volunteer experiences. With hope of a bright future for their children, the newcomers become happy and healthy. They participate in community activities. They’ve developed their own worship services in the churches of the sponsors. One group has formed a choir and has musical groups that perform for fund raisers and to celebrate International Women’s Day. One has an active youth group with members ages 15 to 30. They attend LAERC events and donate generously to help the next arriving family. When LAERC finds out information about the next family we are going to sponsor, we have no problem getting all the donations that enable us to set up a home for each arriving family group from the community. Being a small town, everyone has heard of LAERC. People like to help and feel they are doing something good so we easily get stoves and fridges, washers and dryers, dressers and beds and bedding, tables and chairs, couches and coffee tables, cutlery and china, clothing etc. etc. Local businesses loan us vans to pick up the families at the airport. A local dentist does the first assessment and any work needed for each new family, for free. His dental assistants outfitted one family with warm winter coats, leggings, scarves, hats, and boots. A local lawyer has provided legal services with no charge to the refugees or the committee. One of the main challenges for LAERC, and for everyone sponsoring refugees, is housing. So far, we have been extremely lucky because the local funeral home had purchased a large, brick home beside their business, for future expansion, and has rented it to LAERC for $400 a month. This has enabled us to sponsor larger families and they, in turn, have been able to save enough to buy a house. This arrangement will come to an end in 2019 and we are already realizing that there will be no housing in town for large families so we will have to limit our sponsoring to families with only two or three children. We would love to have a “LAERC House”, but as yet haven’t figured out how to achieve this goal. The people we have sponsored are doing well here in Canada. Eighty per cent of the adults are employed full time, all but four families have purchased homes in various areas around town, all but the last family have purchased vehicles. Some have opened their own businesses and hire employees. These successes have been a positive factor in the acceptance and fitting-in of the newcomers. The town folks see the newcomers as people just like themselves. Neighbours. Their kids go to the same school, play on the same team, ride the same bus. Their skin may be a different colour and they may wear different clothes but they are friends. As the years go by, we continue to maintain contact with the families both as individuals and as a committee. As a committee we provide or arrange for the refugee children to take part in many of the same activities as other children might, but of which their parents have no knowledge, have insufficient money, or they are working shifts and would be unable to transport them – art classes, day camps, week-long camps, dance class, swimming lessons, soccer teams, skating, take them to hockey games, to local theatre performances, cadets, camping weekends, War Amps, and so on. This assists the kids to learn English, have knowledge of these activities when they arise in their reading and school discussions and gives them a common bond of ideas and things to share with other kids. Because we have multiple churches involved, we have a much wider support group than just the committee. Many churches have held fundraising dinners for us, families are invited to help themselves at Rummage sales, many seniors knit mitts & hats, crochet warm throws, make quilts – all donated to our families – a concrete show of love and caring. Facilities are offered free or for a small charge for meetings, parties, newcomer weddings, newcomer baby showers, and newcomer worship services. In Leamington, fortunately we have easy to access Settlement Services that provide LINC classes, day care and assistance with other paperwork as needed. The adults make friends while attending class, attend workshops and learn more about life in Canada, take Citizenship classes, celebrate special days and events, share food and recipes and child care tips. Here they develop community apart from their sponsors but within a safe environment where they know people will be supportive and understanding. This too is a big support for our committee. Of course we have had a few challenges. Being a small town, there obviously cannot be interpreters for all languages. The closest Karen interpreter is 70 km away. This has been a problem at times but it just challenges us to find solutions like speaker phones and video links and has greatly improved our acting skills. Being small, Leamington has no college or university, so when students reach that level, they must travel 70 km to Windsor. There is a small bus that travels directly from Leamington to St. Clair College, morning and evening, or students can ride with other students if they do not have a license and vehicle. This is doable, but I know more adults would take advantage of the great ESL, nursing, social work, etc. courses offered at the college if it was easier to access. Some newcomers arrived with inflated expectations of how rich Canada is and how easy it would be for them to have everything they wanted given to them. Once they realized we too all work for what we get and they have the freedom and opportunity to do so here, they became more content and now have jobs and are happy. Our committee strives to create a feeling, even without language, of being surrounded by people that care and will be there when you need them. It begins on their day of arrival, when a few committee members and spouses pick up the family at the airport. 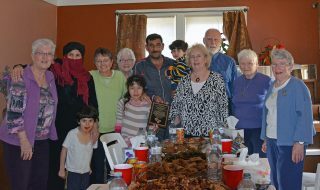 We drive them to their new home where other committee members have prepared a warm, welcoming meal which we all share. We give each family a photograph album with a Canadian symbol on the front and add photos in the coming days of their arrival at the airport, the kids first day at school, their first home in Canada, etc. Each December we have a Pot Luck Feast and party, share turkey, stuffing, cranberries and numerous delicious dishes, play games, and sing carols. New hats, mitts and scarves are provided for all, with gifts for the children and flowers and a card for each sponsored family. It is a happy time of fellowship for all – committee members, families, friends, newcomers, Christians, Buddhists and Muslims. Each July 1st, we celebrate Canada Day with newcomers, committee members, families and friends. We have a pool party including a barbecue and Pot Luck picnic at our home in Kingsville. We share photos of happy fun on our LAERC Facebook page. To further assist in building a good future for these refugee children, we have established a $500 bursary, available yearly to a refugee student going on to further education at a college or university. LAERC’s core committee continues to be motivated, involved, and dedicated. Others join for special occasions and events. We meet once a month, September to June, and keep in touch by email. Even though we spend a lot of time giving to others, we took time to honour all committee members with dinner and a special plaque at our 10 year anniversary. Being small, each member knows they are needed and that they are greatly appreciated by all and they are making a difference.